Issue 5 is out March 29th! Extra Curricular is a journal about folks who get creative with their spare time. The Autumn issue has a ceramics featurette including an interview with Golden Ink Collaborative - Abby Seymour from Golden Ink did the beautiful cover illustration. There's an article about crafters who are ‘mad keen’, a piece on the latest craze to hit Auckland - synchronised swimming, interviews with Spiro Creations, Rose & Sarah from The Bread & Butter Letter and plenty more. You’ll notice a few extras this issue, including a recipe from the Martha Goes Green crew and a tutorial by Melissa from Tiny Happy. 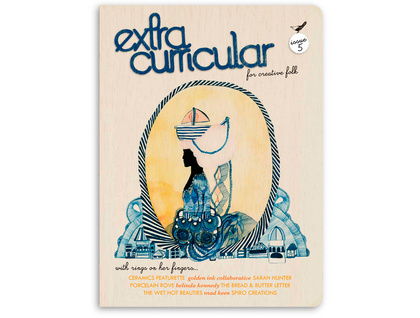 Extra Curricular is printed in full colour with vegetable based inks on 100% recycled stock.